We’ve written how EDH (Ephemeral Diffie Hellman) offers perfect forward secrecy in the sense that if even if you got your hands on some keying material such as a private key file, you cant decrypt past captured traffic. With DHE, what’s done is done, baby. A post on the Wireshark Q&A site wondered if you controlled the client or the server and could output the so called master secret, can you then decrypt the SSL/TLS traffic? The answer is absolutely! If you had the master secret, it does not matter what key exchange algorithm you use. The only question left is : Do you support decryption of the cipher! Unsniff supports entering a master secret directly. Wireshark allows you to enter something called a ‘unencrypted pre master secret’, we think if you can instrument the client anyway – why not just print out the master secret. Unsniff also doesnt care about the session id as a way of mapping flows to keys – the mapping is much weaker. You can arrange to split your PCAPs into flows -> key mapping instead. 0000 - eb 3e 92 dc ef ab dd 75-1f 2b ce 7e 22 58 99 94 .&gt;.....u.+.~"X..
Notice that big string in bold. That is called the master secret. That’s all you need. 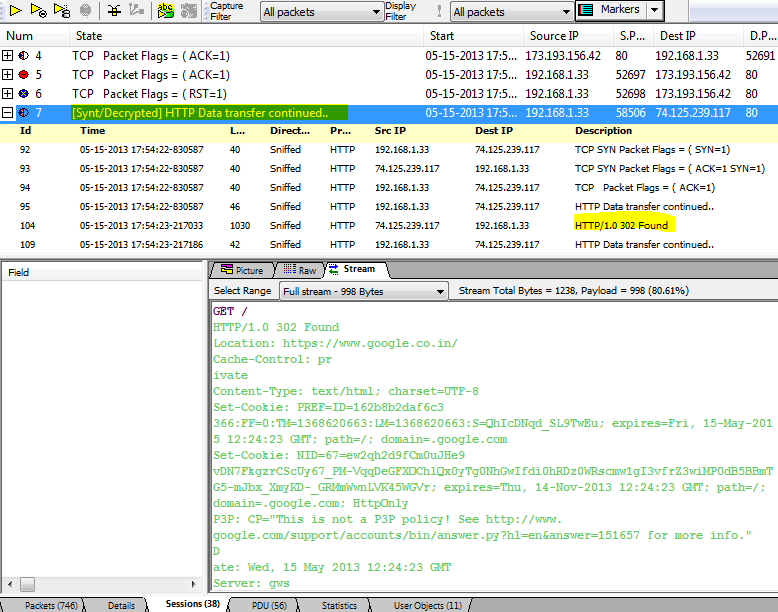 If you have Trisul running in your egress point, grab a PCAP of the above session. Or alternatively run a tcpdump before the s_client tool. Self evident, just use the highlighted buttons. 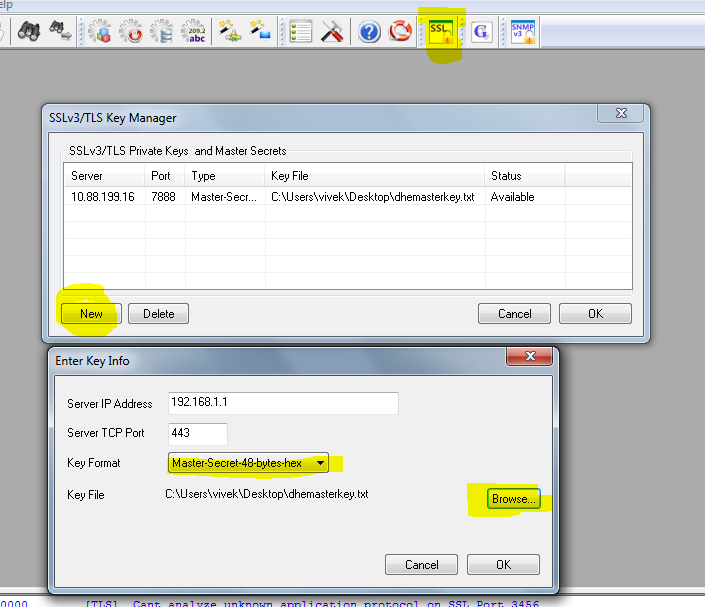 Create a mapping for server ip/port to master key file. The place to observe the action in Unsniff is in the PDU tab. 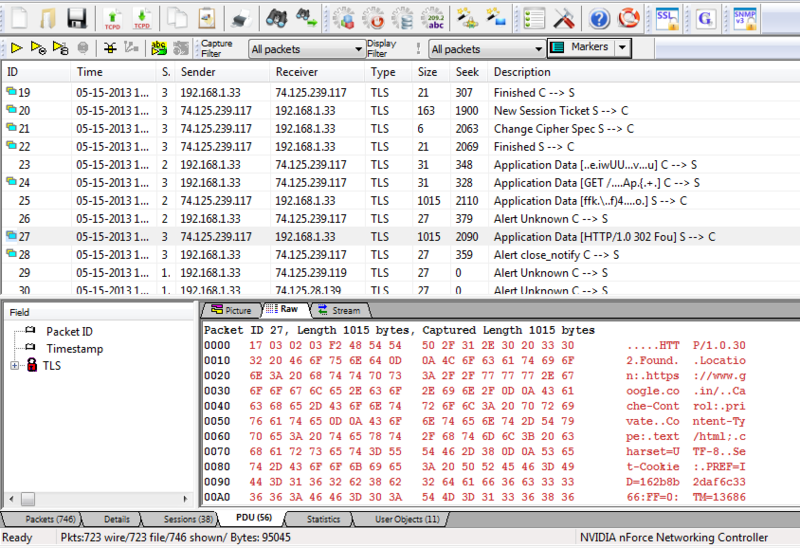 This may be a little confusing for folks familiar with Wireshark’s link packet based views. What Unsniff does it shows you complete SSL “records” – so an Application Data encrypted record maps cleanly into a “decrypted” record. This is shown with an icon on the left side. Switch to the streams tab for two extra streams generated from the SSL stream. We’ve received a bunch of emails asking about Unsniff. We are still heavily improving it, unfortunately the documentation and new website is still some time off due to our big Trisul releases. The latest versions for example have top notch reconstruction – even of Video Chats with playback of VP8 and MPEG4-TS, unidirectional streams from satellite connections and more. Check it out now. I did this exact same steps, nothing got decoded.